An organically grown natural sponge from Beaming Baby, a sustainable alternative to synthetic products. The sponge produces a soft and natural lather and is gentle against your baby's skin making it perfect for bath time. It's also more durable and will last longer than a synthetic sponge as it is more resistant to abrasion. Each organic sponge is unbleached and hand picked from the stem leaving the colony to flourish. Sizes vary from 3 to 3.5 inches across. Beaming Baby donate thousands of pounds to Charity each year, with customers choosing which charities the company will support. They also invest in Gold Standard Reforestation Projects in order to remain carbon neutral. 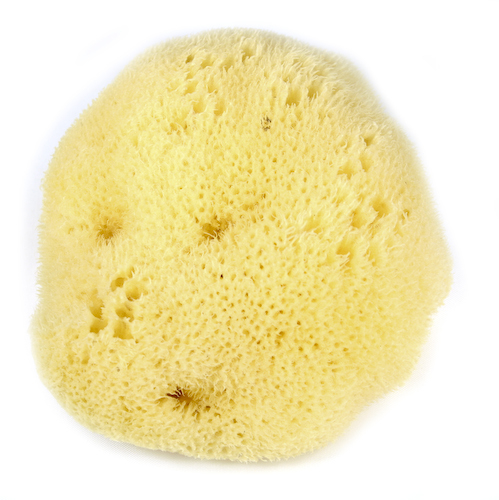 It is advisable to wash your Organic Sea Sponge regularly to prevent soap build-up... Soak in a bowl of water with a little vinegar for a couple of hours and then shake out and leave to dry - as good as new! The Beaming Baby Natural Sea Sponge product ethics are indicated below. To learn more about these product ethics and to see related products, follow the links below. Took advantage of offer at time. Not used yet as present for expected grandchild. Hard to evaluate. Q: what is the diameter of this sponge please? Is it sea wool or silk? A: Hi there, the size of this natural sea sponge varies from 4 to 4.5 inches across. Each sponge is organically grown and sustainably harvested from the Mediterranean Sea around the the Greek Islands. They are hand picked from the stem, leaving the rest of the colony to flourish. When harvested, all sponges are a dark brown. After undergoing an oxygen bleach process the brown colour fades away and a yellow sponge is revealed. I hope this is helpful. Robyn. 9 out of 10 found this question and answer helpful.